Nancy Elizabeth Culpepper, Female, White, Widowed, born 20 Jun 1902 in NC, died 27 Feb 1984 in Morehead City, Carteret Co., NC, SSN: 243-12-5881. Lena Mae Culpepper Locklear; 13 Nov 1929 - 4 Sep 1984; Female; Indian (American); 54 Years; Place of Death: Lumberton, Robeson Co., NC; Residence: Robeson Co., NC; Married; Burial in state; Birth: NC; SSN: 239644636; Fathers Surname: Culpepper. Lena Mae Culpepper is the father of Durward Irving Culpepper, born __ 1946 in Carteret. Obituary* 9 Jun 2007� William Henry Culpepper, 73, of Millington , Tenn. , formerly of Newport , passed away Tuesday, June 5, 2007, at Bayhealth-Kent General Hospital in Dover , Del. , among caring and compassionate caregivers. His funeral will be at 2 p.m. Saturday at Reece?s Chapel Baptist Church . Burial will follow at Chadwick Family Cemetery in Mill Creek. The family expressed its appreciation of the excellent care provided by the medical staff, both in Dover , Del. and at The Med in Memphis , Tenn. The family asks that family and friends join them in sharing the difficult news that Mr. Culpepper, beloved partner, friend, father, grandfather and great grandfather, has passed away after a short illness. His life was filled with love of God, his family, his friends, his neighbors and the townspeople. Originally from North Carolina , Mr. Culpepper lived in the Millington , Tenn. , area for about 45 years. He was currently visiting with his daughter in Dover , Del. Mr. Culpepper was a well-respected business owner in real estate and auto repair. He worked for Goodyear and Goodrich for a number of years. We will always admire Mr. Culpepper?s devotion to everyone, his personal character and the honorable manner in which he led his life. He will always have a special place in our memory and heart. He loved to converse with people and served his neighbors, friends and family well. He had a kind heart and was a friend to all. He is survived by his beloved partner, Mary Brown of Millington, Tenn; one daughter, Wanda Spiering and husband Charles of Dover, Del; one son, Jim Carter of Ventura Beach, Calif; one stepdaughter, Cindy Nemec and husband Brian of Millington, Tenn; one step-son, Jimmy Howell and wife Dana of Millington, Tenn; two sisters, Mary Chadwick of Mill Creek and Sadie Cribb of New Bern; four brothers, Nick Culpepper and Joe Culpepper, both of Mill Creek, Jesse Culpepper of Beaufort and Charles Culpepper of Newport; six granddaughters, Rose Williams, Marcia Dowell, Cheri Coughlin, Kristen Teaff, Kendra Lawler, Kendall House; two grandsons, Keith Lawler and Thomas Poole; and seven great-grandchildren. William Henry Culpepper and Huldy Gray Norris are the parents of William Henry Culpepper, Jr., born __ 1954, and Wanda Gray Culpepper, born __ 1956, both in Carteret Co., NC. William H Culpepper, Jr., died 14 Jan 1955 in Unknown Co., NC. Obituary of William Henry Culpepper, published 8 Jun 2007. Carteret County News, Morehead City, NC. Obituary of William Henry Culpepper, published 9 Jun 2007. Benjamin Franklin Culpepper and Dorothy Mae Brown are the parents of Benjamin Ray Culpepper, born __ 1957, and Dora Jean Culpepper, born __ 1959, both in Carteret Co., NC. E-mail written 12 Jun 2010 to Warren Culpepper from Mandy Smith Murphy, e-mail address. Sadie Elizabeth Culpepper and Pender Nolan Smith had three children: my father Andy Nolan Smith is the oldest, Johnny Alan Smith, and Mary Lorraine (Smith) DiTonno. Lorraine was married to Eddie Dale Reynolds…….one child….Eddie Dale Reynolds Jr.
Each one of the grandchildren are now married and have children of our own. E-mail written Jan 2008 to Warren Culpepper from Andy Nolan Smith (#57891), Hillsborough, NC, e-mail address. Joseph Earl Culpepper and Carolyn Faye Avery are the parents of Joseph Earl Culpepper, Jr., born __ 1963, and Lisa Faye Culpepper, born __ 1968, both in Carteret Co., NC. Charles Edward Culpepper and Sherry Kay Lewis are the parents of Sherry Lynn Culpepper, born __ 1964, and Charles Edward Culpepper, Jr., born __ 1967, both in Carteret Co., NC. E-mail written 9 Aug 2006 to Warren Culpepper from Marocca Ann Thomas Culpepper Chandler (#7798), e-mail address. Anthony Lee Rockefeller, compiler, Hightower Family Genealogical Database, Rootsweb: WorldConnect (online family tree), 1999. Obituary for Mary Louise Culpepper, published 28 Jun 2008. Sue Ann Culpepper, Female, born __ 1958 in Harris Co., Texas, child of James Morgan Culpepper and Mary Louise Forester. E-mail written Jun 2009 - Jul 2014 to Culpepper Connections from Amanda Johnson (#60352), Vacaville, CA, e-mail address. Viet Nam War* between 1968 and 1969� "I had a total of 21 years 8 Months, and 8 days of military service. Other than my states side duty that began in September of 1953, with basic training at Ft. Sill, OK. A Tour to west Germany, in 1954 until September of 1956. All of my service time was in the field artillery. 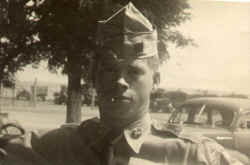 In 1956 I was discharged at Fort Chaffee, Arkansas. I was in the U.S. Army Reserve until March, 1958, when I reentered the U.S. Army and was assigned to Fort Knox, Kentucky. In September of 1958 I was assigned duty in Korea until October of 1959. At that time I was assigned to Fort Carlson, Colorado. "From There I was assigned to Crailsheim, West Germany until September of 1962. From there I was assigned to Fort Lewis, Washington. In October of 1965 I was assigned again to Korea, until November of 1966. From there I was assigned to Hanau, West Germany until December of 1968. From there I was assigned to the 101St. Air Borne in South Vietnam until December of 1969. From there I was assigned to Fort Sill, Oklahoma until May of 1972, and again I was assigned to South Korea until June of 1973. from there I was again assigned to Fort Lewis, Washington and there retired on May 31,1975. E-mail written 1999 to Lew Griffin from Bill Bischoff. OWASSO, Okla. -- Robert Earl Culpepper, 68, of Owasso, Okla., died Saturday at Broken Arrow, Okla. He was born Dec. 16, 1936, at Glendale, Ark., a son of the late James Morgan Culpepper and Fannie Monk Culpepper. He was reared and educated at Pine Bluff. He graduated from Pine Bluff High School in 1954. He served in the Air Force. He retired from OTASCO in 1985 as vice president of the associate division. He was a member of the Masonic Lodge. He was also preceded in death by two brothers, Dan Mack Culpepper and Joe Lee Culpepper; and one sister, Mary Frances Van Cleave. Survivors include his wife, Esther Holman Culpepper, whom he married on June 21, 1957, at Miles City, Mont; two daughters, Lisa Neely of Broken Arrow and Dee Dee Rice of Owasso; two brothers, James Morgan Culpepper Jr. of Tyler, Texas, and Allen Culpepper of Lincoln, Calif; three sisters, Colleen Stuckey of Redwood City, Calif., Kay Rhodes of Sheridan, Ark., and Linda Bridges of Rison, Ark; and eight grandchildren. Mary Blake Culpepper and Andrew Neal Chadwick are the parents of Bobbie Alan Chadwick, born __ 1947, and Jackie Neal Chadwick, born __ 1958, both in Carteret Co., NC. Otis Bucklin Culpepper, Jr. and Mary Elizabeth Bernard are the parents of Alice Marie Culpepper, born __ 1957, and Tresa Diane Culpepper, born __ 1960, both in Carteret Co., NC. Otis Bucklin Culpepper, III and Kathy Lynette Piver are the parents of Lynette Yvonne Culpepper, born __ 1978, Otis Bucklin Culpepper, IV, born __ 1980, and Cory Sean Culpepper, born __ 1986, all in Carteret Co., NC. Alice Marie Culpepper is the mother of Christopher Allen Culpepper, born __ 1975 in Carteret Co., NC.